The Vancouver geothermal home heating industry has been booming in Vancouver and across the province. With the focus on clean, green energy growing over the past number of years, more home-owners and even business owners have been looking for other options to heat their properties. Vancouver geothermal energy companies are starting to see that there are more people looking for geothermal heating. One issue, however, is the regulation and oversight of the industry. It seems that there are no city, provincial or industry overseers to ensure control and that consumers have some sort of fall-back should there be an issue with their geothermal heating installation. The bottom line is that there is confusion about who has responsibility for oversight of the installation of geothermal residential heating systems in Vancouver. It seems that each level of government is passing of responsibility to the other with ultimately no-one taking responsibility. How does this affect geothermal home heating? The challenge arises when less than qualified or experienced geothermal energy companies attempt a project without knowing proper protocol or practise when drilling a geothermal field. 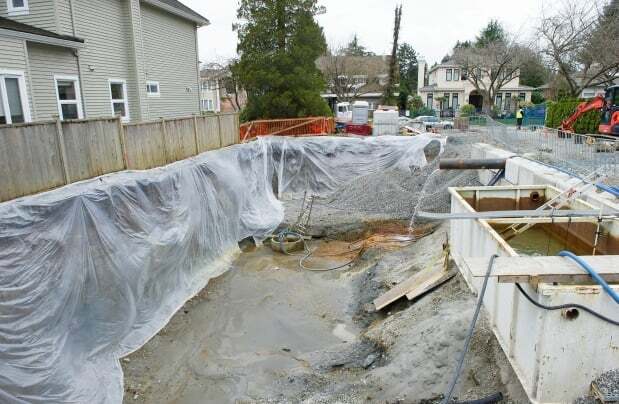 This issue has come to prominence with the torrent of water that threatens multimillion-dollar homes in southwest Vancouver after work to drill for a geothermal — or GeoExchange — system tapped into a pressurized aquifer. An obvious oversight by a less than experienced company drilling a geothermal project. GeoForce Energy has been installing both commercial and residential geothermal heating systems for many years and know the value of expertise and ensuring the project moves forward in a professional manner. If you have questions about Vancouver geothermal home heating or are looking for a professional company to give you a quote on your project, please contact GeoForce Energy at 604.897.3411 or fill in our short form and we’ll contact you right away to discuss your project.